Yup, I read he played drums on at least 40 number one hits. His work on Be My Baby alone is an enviable legacy. Thanks to the always-solid Randy Lewis for a terrific obit on Hal, who was (as we all know) a giant in his field, and a man who was never at a loss for words, either. Thank goodness he'll live on forever on the many, many fantastic records he graced with his presence. Well said. Hal would later perform that same drumbeat on Sinatra’s “Strangers In The Night”. Hal was a Great Guy! I have recorded him many times. He was the El Dorado of pop and rock drumming when all those great ol' hits were made. A joy to work with, he freely gave me tips on microphone placement I have used all my professional life. The US Navy used Hal's steady beat to set their clocks by. I know he could keep time like an atomic clock because I use to record him playing the drums at 30IPS (professional tape speed). In editing, I could mark his beats on the tape and compare one verse of take one to the same verse of take two -- and the beats were usually within a quarter-inch of each other. In other words if you took 15 feet of tape from each take and placed them side by side on the floor, the beats from take to take would line up almost perfect. At 30IPS quarter note beats are every few feet, so the tape is like a magnifying glass for timing. Anyway, Hal was thee guy for drumming thru most of the 60s and 70s and even into the 80s. For an overview of the period check out this movie trailer >>>http://www.magpictures.com/thewreckingcrew/ . To maintain his busy schedule he maintained two completely separate crews with two matching sets of drums and percussion. He just drove from one session to the next while his two crews leap-frogged the equipment from one studio to the next. Hal would have sometimes four or five sessions per day, so at triple scale he was really pulling in the money. 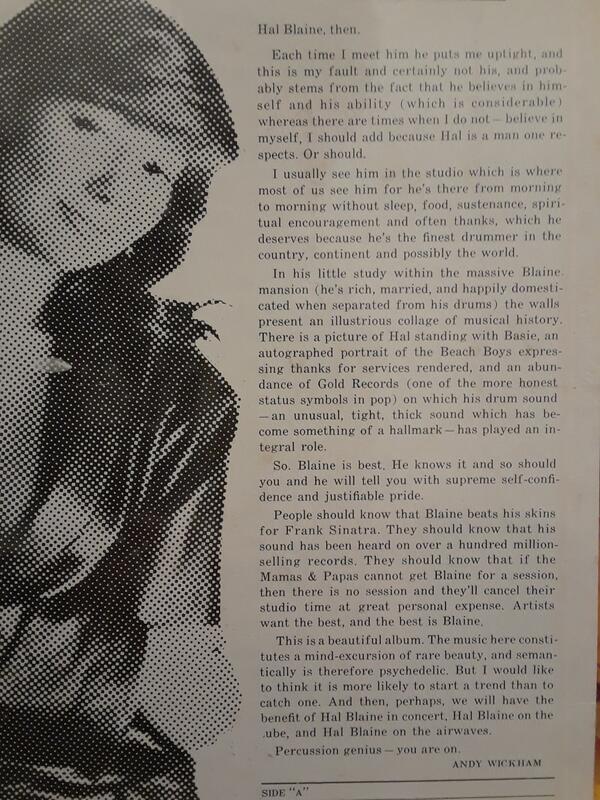 It was Hal Blaine that kept Brian grounded on many occasions! RIP my friend. Thank you, Mr. Desper, for your beautiful and characteristically informative post about Mr. Blaine. He will be greatly missed. Mr. Desper or anyone else who knows: Can you please tell me the name of the tune that begins just after the Boys' preamble to "LDC", right at the start? It's so familiar but the name eludes me. It would be much appreciated. I had to stop and collect my thoughts. The staggering amount of records that are beloved to me that he played on, that I tap my feet to, just wow. Most important, most beloved to me out of all is ‘Wouldn’t It Be Nice’, my favorite song in the universe. Brought to life by Brian and Tony, Hal and the other session musicians, the other Beach Boys and the others in the studio that helped it along. It wouldn’t be the musical wonder it is without them. Hal was the heartbeat of my favorite song. I’ll miss his insights and his humor. Thank you good sir. RIP. "Out Of Limits" by The Marketts, which was the Wrecking Crew. A take-off on the Twilight Zone theme song that became a big hit. Great record. 2 Reply #57 - I've got that HB album. Fave track - "May". 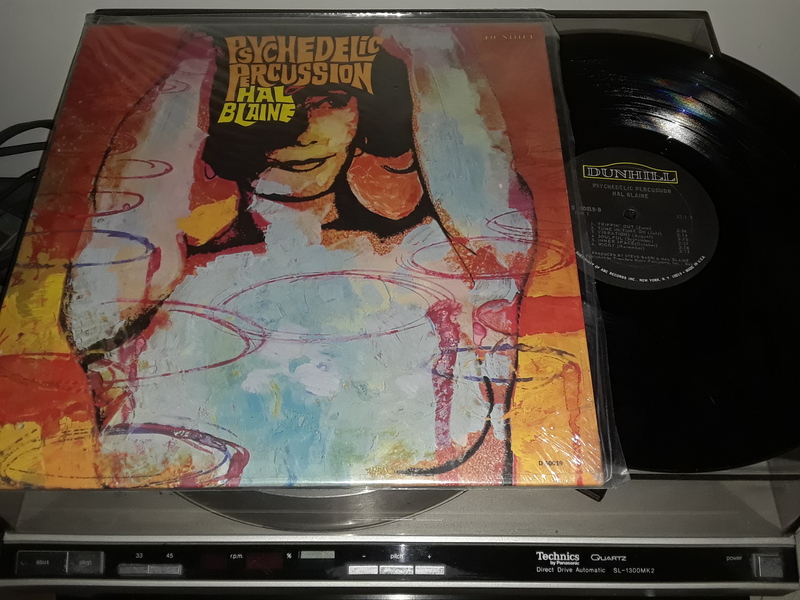 For those who haven't seen it or read the liners, Hal's "Psychedelic Percussion" album, released early summer 1967...I scored this one years ago at a yard sale, still one of the coolest LP finds I've ever had, and it was late in the morning when I stumbled on this one. By rights it shouldn't have been there that late, but it was. Funny how I don't remember things from yesterday, but can remember exactly where and when I found this album. Still hoping to find an original vinyl of Hal's earlier "Drums! Drums! A Go Go" album, the one with his blue kit on the cover, but I refuse to pay "retail" and don't want a CD . 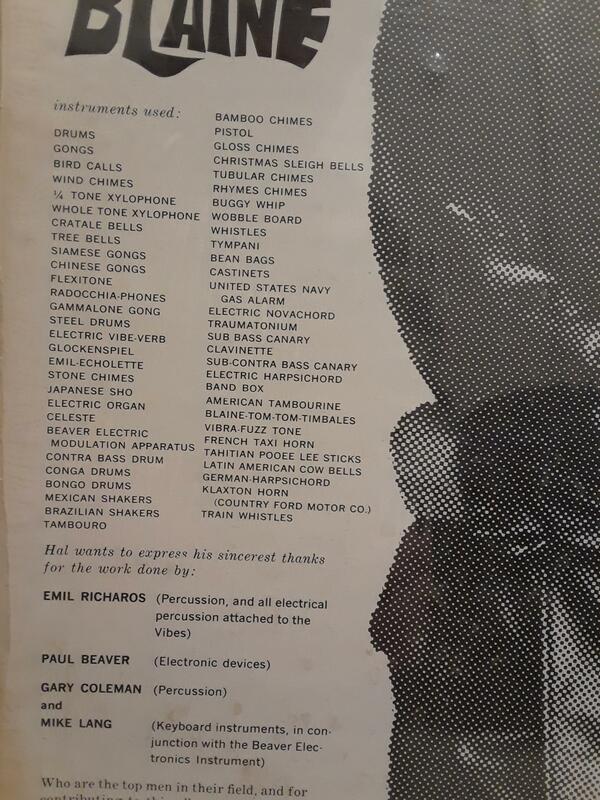 Take a look at the liner notes, there are some interesting items which I'll mention later. Thanks a lot, gf. Yes, a great record. The Marketts did some cool stuff. Love those horn calls! And thanks for posting the album cover. The list of instruments Hal plays on it is mind-blowing. Adding my heartfelt thanks for everything, Mr Blaine. You had a great run on this earth--90 years' worth! You won't be forgotten in any of our lifetimes. I got a kick out of Mr Desper's account of Blaine's two crews following him around from session to session, and I am in awe of Blaine's sense of time as Desper described it. I checked with a ruler just now, and a quarter of an inch is about half the width of my little finger. I'm so sorry it took me so long to see this and thank Stephen. What a wonderful tribute from Hal's working world! Powered by SMF 1.1.21 | SMF © 2015, Simple Machines Page created in 0.125 seconds with 22 queries.